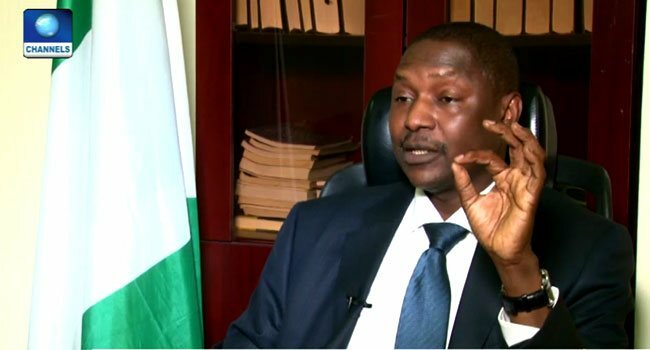 In this interview with Question Time on Channels Television, the Minister of Justice and Attorney General of the Federation, Mr Abubakar Malami, speaks about the controversy triggered by the reinstatement of a former Chairman of the Presidential Taskforce on Pension Reforms, Mr Abdulrasheed Maina, into the civil service among other issues. Now it appears the anti-corruption posture of the Federal Government is carrying a big stain on the controversial reinstatement of Mr Maina, could you set the records straight? Well, the truth of the matter about pension is a serious issue in Nigeria that has a ticket history. I believe you are rightly informed that there exist 12 pending court cases that are related to the pension fund fraud, and I equally believe you are aware that investigations have been ongoing overtime and serious recoveries involving about 270 or more assets involving house and automobiles were recovered over it; and then, I think about N14bn over time. And then, the investigation also reveals that there are existing over 66 accounts that were used in pension fraud associated transactions, and then, I equally believe you are aware that there is a very strong allegation that about 217,000 ghost pensioners exist within the system. And you are equally aware that high-profile individuals – inclusive political office holders, senior civil servants, the military, the police – are equally alleged to be part of the syndicate relating to pension. So, I think the background of the existence of these investigations, coupled with the fact that there were series of attempts to assassinate investigative journalists and then major investigators of the pension fraud, were equally arising from coordinated media attack forced out of the system. It depends on the perspective to which you are looking at it. But one thing I can tell you is that the fight against corruption is gathering serious momentum, is never slowing down. It depends on the perspective at which you look at it. How come your administration, two years after, you have not been able to conclude the case of the controversial pension fraud? Well, if you are talking about prosecution, I think it is one single element among multiple factors in the fight against corruption. Let us look, for example, the case of prevention and preventive measures taken by the government – (Treasury Single Account (TSA) is there and has succeeded in plunging the existing loopholes in the act of corruption. If you look at the Whistle-Blowing Policy that has been put in place, it has succeeded in identifying the existing corrupt practices and addressing them. If you are looking at a lot of other policies relating to legislation, that are put in place and placed before the National Assembly for passage, they are equally part of the processes that have to do with checkmating corruption as a process. Let me bring you back to the issue of Abdulrasheed Maina; it is being alleged that you sent four letters relating to Maina’s reinstatement. Did you order for the reinstatement of Abdulrasheed Maina? As at October 5, 2017, an issue relating to the reinstatement of Abdulrasheed Maina was an issue that was in the process in the Office of the Attorney General, relating to a request that was made by his lawyers sometime back in April. Arriving at a decision like this, some legal processes come into play: the first process was a judgement presented by his lawyer on account of which he had sought the intervention of the Attorney General for his reinstatement and in the first process, thereafter, was a request from the Office of the Public Service of the Federation seeking information to certain enquiries that were met and, thereafter, there was equally a factor relating to a pending court case in the National Industrial Court in respect of which you equally have to factor in mind before arriving at a decision. As at October 2017, the truth of the matter is, it was a process that was not concluded in the Office of the Attorney General of the Federation. Now it is being reported that what you call the FCFC was concerning the court order and warrant of arrest. But what the public is saying is that Abdulrasheed Maina was not removed from office based on the warrant of arrest but because he absconded from work. The correspondence that exchanged hands over time in relating to addressing Maina were mostly inquisitive as the Office of the Attorney General, seeking clarification on certain issues. In arriving at a decision in one way or the other, you require a lot of information and the information has to deal with the processes and the antecedents leading to the judgements if any, orders if any, pending suits if any – it is in the combination of these that you now analyse and arrive at a decision. That is why I told you earlier that it is a process that was ongoing, that has not been concluded as at October 5, 2017. Now, if I may ask, what is your relationship with Abdulrasheed Maina? Well, the truth of the matter is that I do not have any relationship whatsoever with Abdulrasheed Maina. The first time ever in life that I came across Abdulrasheed Maina was in January 2016, and that was during a treat in UAE in which I formed part of the entourage of Mr President. Abdulrasheed Maina was in exile so to speak and he made several attempts through the protocol and associated security officers of the President to meet with Mr President. He couldn’t penetrate, he was not accorded the audience. Some people within suggested he could approach the Attorney General because he was part of that entourage. They gave him my number and he made several attempts to talk to me, but no way. The controversy generated back home; I had to seek the opinion of the security agencies as to whether to grant him audience or not and it was suggested to me that it is good, information is vital, I should grant him an audience, even against the background of the Office of the Attorney General relating to prosecution and associated things. So I had course to meet with Abdulrasheed Maina for the first time then in January 2016, in company with the National Security Adviser (retired Major General Babagana Moguno) where Abdulrasheed Maina now gave us a very heavy rundown of the prevailing fraud within the pension scheme and offered to assist the Federal Government in plunging the loopholes, making information available that could be useful to the Federal Government and then associated vital information. So that was the first time ever in life that I came in contact with Abdulrasheed Maina. Well, the reinstatement of Mr Maina in the absence of a judgement of a court, for example, you should naturally be a function of the Federal Civil Service Commission because as an employee of the Federal Civil Service, it is the responsibility particularly if you have a recourse to Section 158 of the Constitution and in exercising that discretion, the constitution is clear. The Federal Civil Service is not bound by any directive of any person or organ of government. So constitutionally, if you are talking of the reinstatement of Mr Abdulrasheed Maina, it is a function of the Federal Civil Service Commission. Who reinstated Mr Abdulrasheed Maina? When it borders on constitutional issues, as I stated rightly, the function is exclusively that of the Federal Civil Service Commission. But then, if issues arise particularly as it relates to the judgements of the court and others, the Office of the Attorney General of the Federation has a responsibility to seek for clarification, to seek for certain information from any agency of government for the purpose of interviewing when the need judiciously arises for surveying. Now the President has also been dragged into this and legal experts are saying that he has no constitutional powers to disengage Maina from service but he should concentrate on the role of his aides in reinstating Mr Maina; what do you have to say about this? Well, generally issues that border on establishment, issues that border on executive powers are issues that you have to analyse within the context of the constitutional provisions and associated legislation if any. So to the extent, whether Mr President reserves the power to take positions or not, I think is something that you have from the perspective of what constitutes the powers of the executive. People are saying that since you are fully aware that the EFCC has placed Mr Maina on a watchlist, you never confined with the EFCC in all the processes of the prayer for his reinstatement. Maybe one other issue that you need to factor into consideration is that Mr Abdulrasheed Maina as a person has instituted multiple actions in court and among the actions instituted by him is an action against the Immigration, EFCC, and Inspector-General of Police to the effect that he should be taken out of the watchlist and an order was granted accordingly. In compliance with the court order, these agencies of government do not require any sanction from the Office of the Attorney General and then perhaps on their own, they unilaterally lifted him out of the watchlist. And then, perhaps Mr Maina came into Nigeria on his own arising from the court orders that were granted. So the Office of the Attorney General fled no wrong whatsoever in bringing Mr Maina back into the country. Is the government considering absorbing Maina into the civil service as a reward to the vital information he is providing on the pension fraud? The government has not taken any position, has not given any commitment to Maina in return for the information that he has provided and then for you, it is equally important to put across for the notice of the public that absorbing Maina in the event that he is absorbed back into the system does not grant him any immunity from criminal prosecution or investigation when the need for such arises. It may interest you to know that about two months back, arising from the Whistle-Blowing Policy, a law firm by the name ‘Sheriff and Co.’ filed an application in the Office of the Attorney General seeking to recover a certain amount of money, I think about N283m from an account associated with Maina and then, that instruction was accorded and that money was recovered. The law firm was eventually paid the recovery fees arising from the recoveries made. Now, $2bn at stake. What is the truth about this pension fraud? It will be pre-emptive for the investigation that is ongoing and then secondly of the processes relating to the planned prosecution of the high-profile members of the pension syndicate for me to start naming them because it will undermine the possibility of prosecution. But one thing I want to put across to the public is that the list of those involved cuts across almost all spheres. As members of the executive, within the executive circle, you have people that are involved. Within the legislative circle, people are involved and among all the civil service as well. Is the government keen in unravelling these people involved in the pension fraud and also considering bringing the syndicate to book? The process is ongoing and I will tell you in all sincerity that it was that process that now generated into those things relating to your statement. Perhaps maybe the syndicate have been trying to use the issue of Maina to overshadow what the government is trying to do in terms of investigation and prosecution of members of the syndicate. Mr Maina was in exile for a long while and people are wondering, why did you clear him and prevented his arrest? I want to assure you that the Office of the Attorney General has not cleared Maina. And then in terms of giving protection to him against arrest, the Office of the Attorney General does not have any instrument of authority at its disposal in providing protection to any individual. But one thing I can assure you is that no immunity is conferred on Maina and then the Office of the Attorney General, even as at October has taken steps to make recoveries against certain companies and individuals who are allegedly directly connected with Maina. Does that suggest in any way there might be institutional compromisers in relation to the investigation and also the prosecution of the pension scam? You cannot rule out compromisers generally but one thing I want to bring to your attention, for example, is as at 2013 and 2014, Maina had course to go to court severally and obtained a lot of judgements and orders at that time. Those judgements and orders were against institutions like the EFCC, Immigration, National Assembly, Inspector General of Police. From 2013 when such judgements and orders started coming Maina’s way, there wasn’t any attempt by any agency to appeal against those judgements offered in an application for stay of execution. After the time in 2015, when this government came into office, from 2013 after he started going to court till 2015, there was nothing established on record of any attempt to challenge the orders and judgements that were being obtained by Maina. Now there has been a widespread allegation that the Federal Government has bluntly disobeyed court orders. Well, the conclusion as to compliance or obedience to court orders is not a conclusion one can readily reach without fathoming the processes associated with compliance of court order in mind. If an order is made, you appeal against the order. For example, you file an application for a stay of execution of an order, it will be pre-emptive for you to jump into conclusion that there exists disobedience to the court order. Are you bringing in institutional bottlenecks to advert obeying court orders? No, when rights exist, I think entitlement to exercise it equally comes into play. You have a constitutional right of appeal against judgements and orders and then you are entitled as a matter of fact to exercise such rights when you feel you are not fairly treated or when you feel there is a need to appeal against those orders. That is one aspect of it, but then again, when there is multiplicity of investigation, that naturally comes into play. You are, for example, charged with fraud, and then along the line, the cases of murder emanate that calls for investigation around your person. The fact that you are granted bail over the charge of fraud does not prevent the institution or establishment from taking further investigative steps over murder and that does not automatically entitle you to comply with the order relating to fraud when you know there exists a pending serious investigation that has to be carried out for the purpose of establishing a case. You are a member of the three-man probe panel that investigated the former SGF and the former NIA boss. But the public is worried that even up to this moment, the details of that report have not been made public. This government has demonstrated serious political will of transparency in doing things. And that is the more reason why you have the freedom of information take place, freedom of information which entitles you to information on request. So the bottom line is, is there a request for information? Is there denial? My answer is clearly no. There is no request that has been denied and then, the members of the public are entitled to know. And then, if they are indeed interested in knowing, they have to comply with the requirements of the freedom of information. It is not something that you are obliged as a matter of obligation, as a matter of duty to make public in the absence of demand, against the background of the Freedom of Information Act. The Chairman of the Presidential Advisory Committee against corruption, Professor Itse Sagay, said that the anti-corruption team needs to go back to the drawing box to search and scan the constitution on how to deal with the terming scourge of corruption; is this not an indictment? Well, the process of going back to the drawing box for the purpose of the enhancement of the efficiency of any system, I think cannot be adjudged as an indictment but I think that calls for a greater action with a view to achieving greater results. So I do not look at it as an indictment, but I look at it as perhaps maybe the need for taking further steps in terms of enhancing the system as it exists, by way of bringing new ideas, additional consideration, that can now reinvigorate the process. It is time to take account of stewardship. It is sad to note that the whistle-blower of the $15bn Ikoyi stashed fund is yet to be paid. The starting point now, as it is, for example, is the whistle-blower signing an agreement which we call the Whistle-Blower Engagement Agreement of the Federal Government which is done in the Office of the Attorney General. When the agreement is signed and then the agencies move into action, when eventually recoveries are made, they are usually lodged in the Federal Government’s Recovery Account in the Central Bank of Nigeria. Often such lodgements, there has to be a request for the payment of the fee from a whistle-blower, and then you will now attach the request. You will equally attach the whistle-blower agreement that has been signed and forward same to the Central Bank and seek confirmation from the Central Bank on the lodgement of that amount of money. The Central Bank will now confirm to you the existence of such amount of money and then, armed with the copy of the agreement, the copy of the letter of request and then a report from the Central Bank that lodgement has indeed been effected. The Office of the Attorney General now processes the request for payment to the Ministry of Finance which now has the final mandate to process the payment.